School Fundraiser Program - Readers grow into leaders! Combine education and the importance of reading with this easy-sell book fundraiser. A great complement to schools with greenhouse or gardening programs. The Greenhouse Kids series by Shelley Awad, is both entertaining and educational. The books can be sold to students and members of your community. Reviews are rated 5 Stars on www.amazon.com in USA and www.chapters.indigo.ca in Canada. Description: In the first mysterious adventure, Dan Delion sets out hunting bugs, and discovers a secret that is much too big to keep to himself. He shares his secret with the other Greenhouse Kids-Holly Hocks, Johnny Jump-Ups and Foxy Gloves. 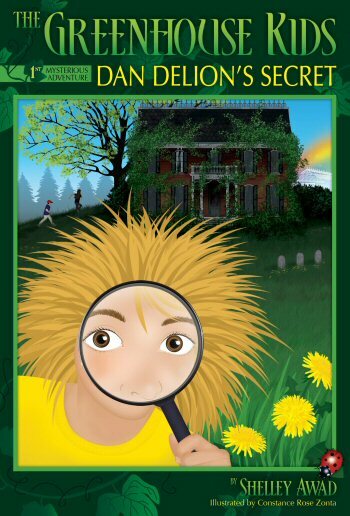 Part mystery, part educational, this charming gardening-themed tale has been enjoyed by children across North America. 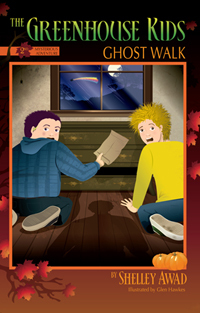 Description : Ghost Walk is the second mysterious adventure in The Greenhouse Kids series, and continues the story of Dan Delion's Secret. Before The Greenhouse Kids can plant Lucinda the Ladybug's special seeds they must first solve a riddle. Solving the riddle leads them back to the English Ivys' haunted mansion where they must now solve another mystery. Find out who they had to meet at school, what was in the seed packets, and who was in the haunted mansion. For children aged 8 to 12.